JOHN FROST was “of this parish” when he married in Sandwich in 1700. There is one baptism which fits this date. Baptism. St Mary the Virgin, Sandwich. 1677 23 Sep John the sonne of John Frost and Susanna his wife. His mother was Susanna Neale, who had previously been married to the widower John Brockman. This younger John was the first of the Frosts to be born in Sandwich. His father was from the Isle of Thanet in NE Kent when he married. John was the eldest of six children, with an older half-brother and sister. Four of his siblings died before reaching adulthood, suggesting that this was one of the poorest families. His mother died when John was 13. DEBORAH READ. Deborah daughter of Anthony Reade and Susanah was baptised at St Peter, Sandwich, on 7 Nov 1670. Her parents’ marriage has not been found, so we do not know Susanah’s surname. Deborah was the fourth or fifth of ten children, four of whom died before reaching adulthoood. This may be an indication that she was from a poor family. Her grandfather, Anthony Reade senior, had been a maltster, but this branch of the family may have fallen to a lower economic level. Her first marriage was to a labourer. She came from a family which favoured biblical names. This may indicate a leaning towards Puritanism. If so, they would have been pleased when the Catholic-leaning James II was replaced by the staunchly Protestant William of Orange and Mary II in 1689 in the Glorious Revolution. St Bartholomew’s Hospital was an extraparochial area within the town of Sandwich. It had its own chapel. It is thought to date back to 1190, when it was founded as a hostel for travellers and pilgrims. There were sixteen resident brothers and sisters. It stands on the Dover Road, on the outskirts of the town. Deborah’s age is given as 21. The note also says that the groom is shown as Smith in the parish register. He is Smithson on the marriage licence and at the baptisms of his children. Woodnesborough is 2 miles from Sandwich. There were four children of this marriage. 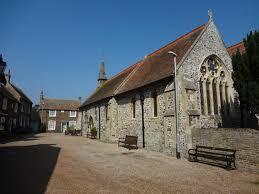 The first two were baptised at St Peter, Sandwich, and the second two at St Mary the Virgin. Richard 1692 2 Oct .
Elizabeth 1696 4 Oct. Elizabeth lived only three weeks. She was buried on 25 Oct.
Four-year-old Richard also died. His burial was on 25 Aug,1697. The following month, Deborah’s first husband William died before the birth of his last child. William Smithson “laborer” was buried at St Mary the Virgin, Sandwich, on 8 Sep 1697. Susanna was born two months later. She was baptised on 21 Nov 1697. The following year Deborah lost the third of her children. Mary was buried on 28 Dec 1698, also aged 4. Deborah was 29 when she married John Frost. John was 8 years younger. They were married on 13 Jan 1700/1, at St Mary the Virgin, Sandwich. John Frost to Deborah Smithson vid, both of this parish. She had another six children from this marriage. They were baptised at St Mary the Virgin. Two years later, Deborah lost the last of her four children by William Smithson. Susannah was buried on 10 Feb1705/6 aged 9. This was followed later the same year by the death of Mary, who was buried on 16 Jun 1706, aged one. Deborah went on to have other children fathered by John Frost. Gerrard 1712 4 Sep. Gerrard lived less than three weeks. He was buried on 21 Sep 1712. Thus Deborah lost all four of her children from her first marriage and three from her second. The register records the burial of “John Frost poor” on 22 May 1729 at St Peter’s. This indicates a pauper funeral at the parish’s expense. He was aged 52. Deborah survived him by 3 years. 1732 9 Apr Deborah Frost widow.